Back in April, when very few were concerned about the fate of the US credit market where credit spreads were approaching all time tights, Morgan Stanley asked what would turn out to be a prophetic question: "Is the credit cycle about to crack", and taking a contrarian position, answered in the affirmative. 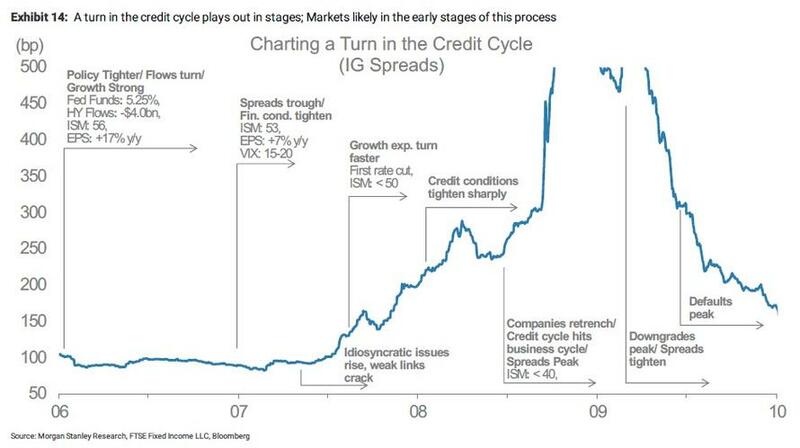 Seven months later, as part of its 2019 Credit Outlook, Morgan Stanley takes its dismal take of US credit one step further, and in a report from strategist Adam Richmond, writes that "the credit bear market, which likely began when IG spreads hit cycle tights in Feb 2018, has begun and will continue in 2019, with HY and then eventually loans underperforming, as headwinds shift from technicals to fundamentals." To frame the temporal context of its gloomy assessment, Morgan Stanley writes that just one year ago not a cloud was to be seen on the credit horizon as "2017 was the ‘Goldilocks’ year" as growth expectations were rising on the back of a synchronized global expansion, investors could look forward to the possibility of tax cuts, and monetary policy remained very accommodative, aided by low inflation. The picture started to change in 2018, when challenges began to mount, but remained mostly technical in nature. In other words, while the economy and earnings both boomed, in part due to fiscal stimulus, the Fed began stepping harder on the brakes, weakening the flows into US credit. As a result, IG spreads widened - blowing out sharply in October and November - and resulting in negative excess returns YTD. High yield was more resilient to weakening demand in part on the back of low supply, however it took cracked recently and the loan market bucked the outflow trend as investors searched for protection from higher yields. While 2018 was the transition year, in 2019 Morgan Stanley things that "it gets tougher on both fronts – monetary policy should near restrictive territory for the first time this cycle, while the tailwind from a booming economy fades as growth decelerates and earnings growth potentially slows to a standstill." Hence, the bank's credit strategist Adam Richmond believes the challenges will shift from just technicals (tighter liquidity conditions/ weaker flows) to also fundamentals (concerns around credit quality/ weakening growth), and as that happens, late cycle risks may turn into end-of-cycle fears, with the higher beta/ more levered parts of credit markets underperforming. Looking at the key risk factors heading into 2019, Morgan Stanley first highlights tightening liquidity conditions "which should remain a headwind in 2019, at least initially, as the Fed pushes rates near restrictive territory, while continuing to shrink its balance sheet at the maximum rate, for now." Taking a step back, for most of 2018, we argued that a tightening in Fed policy, especially in the current cycle, was a material headwind for credit. In a nutshell, central bank stimulus was massive in this cycle, and highly supportive of credit. We thought the process in reverse, at the least, would weaken the flows into credit markets, driving higher volatility, with less of a “liquidity buffer” to cushion the shocks. In our view, these headwinds have materialized, just slowly and in stages. And as the bank shows in Exhibit 2 and Exhibit 3, flows into credit markets did weaken notably in 2018 across multiple sources, including both mutual funds and foreign demand. It was these weakening flows that initially hit global credit markets this past year, one-by-one. For example, Exhibit 4 shows the spread widening in 2018 in US IG, in EM credit, in European credit, and most recently in US high yield, with financial conditions tightening in the process. The reason why flows and liquidity are critical for credit is that they help to mask adverse shifts in fundamentals, or as Morgan Stanley notes, "fundamental issues are easier to hide when liquidity is flooding into markets, and it is not anymore." Furthermore, as liquidity conditions get squeezed, it is natural for dispersion in performance across asset classes, regions, sectors, and single names to pick up, with the weak links breaking first. US high yield was more resilient for most of the year than other markets, in part due to very low supply, and in part given its close ties to the strength in the US economy. But as Richmond notes, even HY, the "resilient" credit market, has only managed a roughly flat total return YTD, despite very strong earnings growth, a solid US economy, and supply down ~30%, which we think speaks to the importance of this tightening in liquidity conditions. The bank believes that these two factors will create an even more challenging backdrop, with the outperformance of higher beta credit fading as a result. And while one can debate where monetary policy sits in relation to neutral, in the bank's view "the flattening in the Treasury curve this past year, the tightening in financial conditions, as well as some of the weakness in key interest rate-sensitive parts of the economy, such as housing and autos, tells us that monetary policy is already pretty close to ‘tight.’"
Adding to the liquidity risks, Richmond reminds us that this tightening will not be just a US phenomenon going forward, as the ECB will be done buying bonds next year and hike in 4Q19, and the BoJ and BoE will hike in 2Q19, with the BoJ likely to reduce JGB purchase amounts as well. But going forward, these dynamics are changing, with US growth expected by Morgan Stanley to decelerate notably, from 3.1% in 2018 to 1.7% in 2019, (with GDP growth of just 1.0% in 3Q19) as fiscal stimulus starts to fade, the interest rate-sensitive parts of the economy (i.e., autos/housing) continue to soften, financial conditions tighten, and tariffs weigh on business investment. As shown in Exhibit 9, the global economy has already slowed, with the US bucking the trend so far, thanks in part to atypical late-cycle fiscal stimulus, but as even the Fed increasingly seems to concede, the US will converge to the downside as 2019 progresses. Shifting attention from macro to micro, Morgan Stanley's strategists expect a material slowdown in earnings growth, with the likelihood of an outright earnings recession for a quarter or two in 2019 reasonably high. In their view, comps get very challenging next year, and margins will compress, with slower top-line growth and costs rising in many places, despite consensus expectations for margin expansion. We think markets are finally waking up to these earnings/growth risks with this recent sell-off. Adding everything up, Richmond thinks macro challenges will grow in 2019. Monetary policy will continue tightening, with global central banks committed to removing stimulus. During this time, the environment of very strong US growth and very robust earnings growth will fade, and this backdrop will become even tougher for credit, especially some of 2018’s outperformers like US HY and loans, and continue to expose the fundamental challenges in the asset class built up over nearly a decade-long bull market. Inflation pressures build, the Fed progresses in its rate hike cycle, and credit flows begin to weaken, in part as higher rates mitigate the need to reach for yield. Financial conditions begin tightening, volatility rises, and spreads drift wider after hitting cycle tights, all while the economy remains strong. Idiosyncratic problems pop up more frequently as tighter liquidity conditions start to break the weak links. The excesses that built up in the bull market slowly start to expose themselves. Economic data begin to decelerate and growth expectations turn lower, slowly at first and then eventually much faster. Market sentiment turns more sharply as end-of-cycle fears rise, credit conditions tighten quickly, spreads gap wider. Companies retrench as earnings decline and the most levered credits lose access to capital – the credit cycle feeds into the business cycle. The chart below shows what this sequence looked like during the last credit bear market/recession. Needless to say, Morgan Stanley is confident that this process has started, with price action in 2018 more consistent with the start of a bear market, than simply a bull market correction, because "the former starts slowly, can last years, and initially hits various markets in stages. The latter is much shorter (2-3 months on average), with markets often dropping much more in tandem." As a sidenote, Richmond notes that all but two of the past 15 credit bear markets (back to 1925) have coincided with recessions, with 1986 and 2016 the exceptions. However, the lag between the start of a credit bear market and the start of a recession can vary significantly, from just a few months, to several years, as shown in Exhibit 16. Which brings us to the key question for 2019: When does the market realize that for the second year in a row, Morgan Stanley's pessimistic outlook is correct, or in other words, when do growth expectations turn lower more significantly and when do credit conditions tighten faster? As Richmond answers, that process can happen quickly, like in 2007 (Exhibit 16 above), or much slower with many twists and turns along the way, like in the late ‘90s/ early ‘00s; this time it will likely fall somewhere in between. Either way, given the bank's forecasts for materially slower economic and earnings growth next year, growth expectations will decline more noticeably in 2019 as the year progresses. In the leverage loan market, covenant quality is weaker than in 2007, the cushion beneath the average loan is lower and 1st lien leverage levels are higher. 48% of LBO transactions are levered over 6x vs 51% in 2007, but as a part of those leverage numbers, 27% of deals have EBITDA adjusted for prospective cost savings/ synergies vs only 15% in 2007. 22% of loan issuance was B- or lower in 2018 vs 15% in 2017 and 13% in 2007, driven in part by record CLO demand/issuance. IG debt outstanding has grown by 142% in this cycle and non-Fin BBB debt has grown by 181%. IG leverage is 0.68 turns above 2007 levels today. Non-Financial corporate debt/GDP has never been higher. And IG interest coverage, which used to be a bright spot is now below 2007 levels. The loan market has grown by 88% in this cycle, with 24% growth just since the beginning of 2017. Much has been made about a shrinking HY market. Remember, HY debt outstanding has still almost doubled in this cycle, just much of that growth occurred in the first half, not that different from how it played out in 2006/07, when most of the leveraged finance growth also came from loans. Additionally, 64% of speculative grade debt has a corporate family rating of B2 or lower today vs 53% in 2007. 2018 was a record year for M&A loan issuance and 25% of IG supply was issued to fund M&A this past year, while stock buyback volumes (ex-fin) hit a record this past year. Certain investors have reached out the risk spectrum for yield aggressively in this cycle, given rates at or below zero globally for many years, with non-US ownership of US corporate bonds increasing to 30%, as one example, although declining in 2018 on the back of rising currency hedging costs. While consumer balance sheets are clearly healthier in this cycle, non-mortgage consumer debt/GDP is just off of record levels. CRE prices are ~25% above prior cycle peaks. 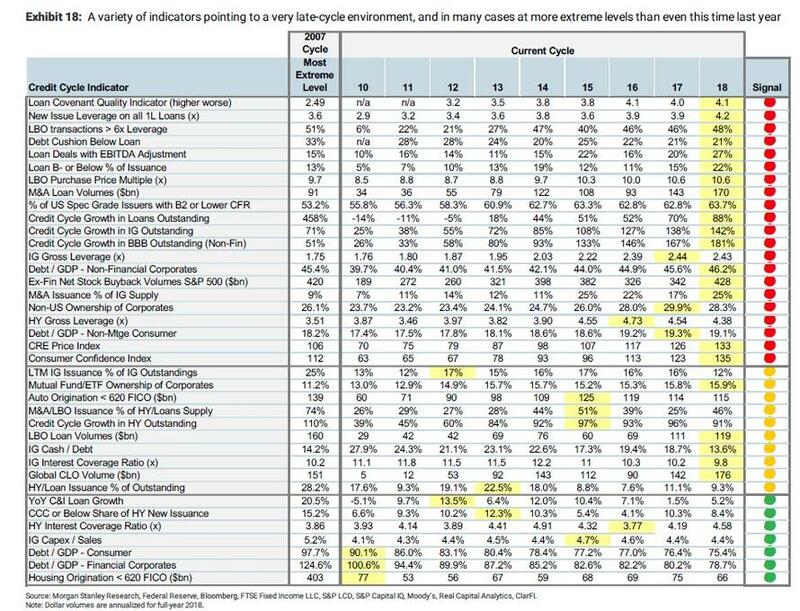 We have seen lax underwriting quality in this cycle in pockets of consumer credit (e.g., autos), also shown in the table. Finally, here is the Morgan Stanley credit cycle checklist. As the bank puts it, "a variety of indicators pointing to a very late-cycle environment, and in many cases at more extreme levels than even this time last year."